Herman W. Hansen was one of the earliest fine artists to popularize cowboy action scenes and other Wild West imagery. Born in Dithmarschen, Denmark (now Germany) Hansen showed artistic promise early on, and his father, a draftsman, sent him to Hamburg at age 16 to study with a painter of battle scenes. In 1876 he went to England for study, but stories of the American West had piqued his imagination and he emigrated to New York the next year. He worked as a commercial illustrator in New York and then Chicago where he also took classes at the Art Institute. In 1879 one of the western railroads sent him to paint advertising scenes in the Dakotas, giving Hansen his first taste of the West. After spending a few years exploring western cattle country, Hansen settled in San Francisco in 1882. There he married Olga Josue and the couple had two children. Their son, Armin Hansen (1886-1957) became a famous painter and etcher of marine images. From San Francisco, Hansen continued to make summer sketching trips through the Southwest and the northern Plains. He became friends and painting companions with William Keith and Maynard Dixon though each cultivated a very different painting style. Hansen had his first exhibition in 1901. After his studio was destroyed by the earthquake and fire of 1906, he moved across the Bay to Alameda, California where he lived the rest of his life. Hansen was a superb draftsman who made highly realistic and detailed depictions of horses, riders, and the rugged western landscape. Although he did work in oil, most of his paintings are watercolor, and he is considered a virtuosic practitioner of the medium. 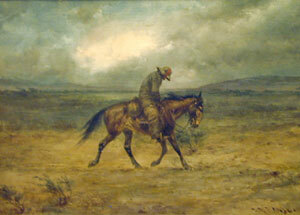 His greatest skill was in capturing the movement and tension of horse and rider in action. Near the end of his life, Hansen made eight etchings under the tutelage of his son, Armin. Hansen’s art had been inspired by the romance of the mythic West and he became one of the great portrayers of that myth. Like many of his contemporaries, at the end of his life he mourned the passing of the untamed life land he had loved.